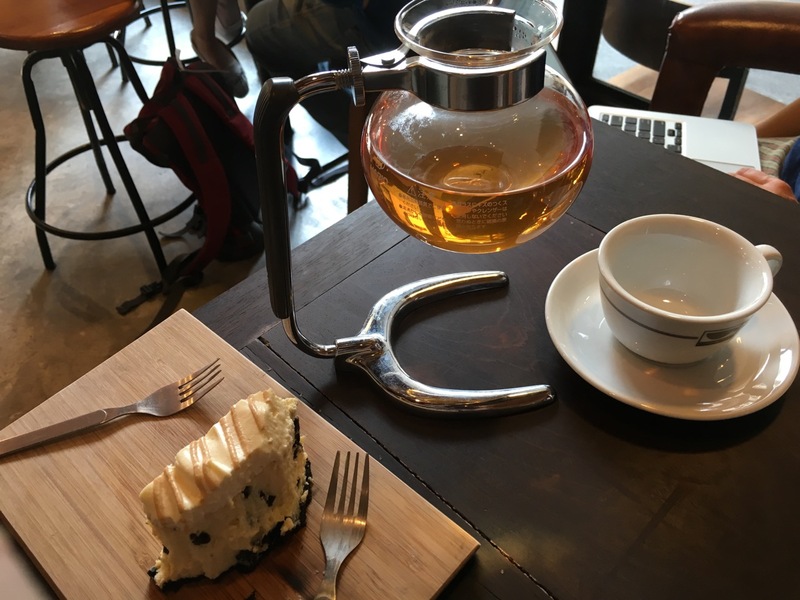 If you’re a friend or a regular reader of this blog, you’ve probably noticed I have a thing about coffee. Well, on my previous trip to Bangkok, I discovered a really cool little coffee shop by total accident. I wrote about that back in November 2015. The place is called FOONG Coffee & Bar. I knew I was in the right place when I walked in and the first thing I saw was this, a cold drip maker. Sadly, they didn’t make any cold brew coffee that day, so I had another cappuccino and a Banoffee dessert. 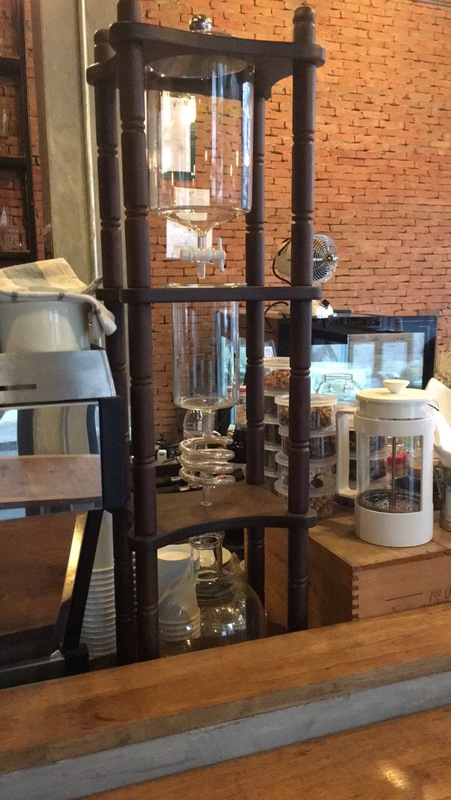 Next to seeing the new Star Wars movie, the second highest priority thing for me to do in Bangkok was to return to FOONG, hopefully to get some cold drip coffee. This time, I inquired in advance via Facebook. The owners were very kind and basically said, “For you, we will make a special batch.” So we agreed on what day I would visit, so they could make all the preparations. It takes several hours to make cold drip coffee correctly. And if their cold brew was anywhere near as good as their cappuccino, I knew it would be worth it. So on Saturday January 2, Beth and I caught the Orange Flag Express Boat from the Central Pier at Sathorn near our hotel north to the Phra Arthit pier, which is next to FOONG. When we first got there, the door was locked and nobody was inside, so we went to the little restaurant next door and had some curry lunch. While we were eating, the owners arrived and opened up the store. By the time we finished lunch, several customers had already found their way in. We grabbed a table and I chatted with one of the owners a little. She knew who I was without having to ask. So I said that of course I’ll have some cold drip coffee. Beth had iced chocolate. Off and on over the next couple hours, I talked to both the owners. They’re a couple who own and run the coffee shop. I never thought to ask their names, but the man is the main barista and knows a lot about coffee, while the woman is the chef and apparently deals with all the food. They had a third guy helping out who wasn’t there the first time I visited. After a few sips of my iced coffee – “iced coffee” in the American sense of the term, not the way the Indians or Kiwis use it – I realized I should get a photo. They serve it in a wide but short glass, with one big chunk of ice. It was good, not surprisingly, though I don’t think I liked the coffee blend as much as some for this. It was a blend of beans from Thailand and from Rwanda, and tasted very much like dark chocolate. But it didn’t have the fruitiness that I like so much in cold brew coffee. Still, I’d have it again. I didn’t want another coffee drink, so for my second drink I ordered tea. They had a few small glass jars of teas, and I picked the one that smelled best to me. Then they prepared it in a glass siphon. I’d seen people make coffee in these, but never tea. The tea came out really good, and I used it to help wash down a huge piece of chocolate cookie cheese cake. When it was about time to go, I found that they had bottled up some of the cold drip coffee for me, for taking home. It’s in these glass flasks, so I took one, which is enough for two smallish portions. That prompted me to make some ice in our hotel room fridge, using mineral water. 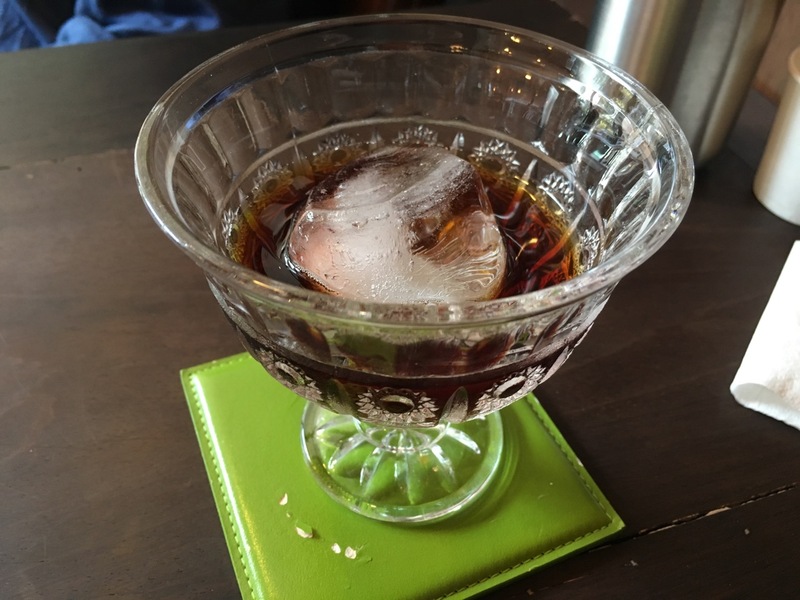 And so a couple days later I enjoyed some iced coffee while writing this blog! I haven’t explored very much of Bangkok, really – just a few isolated pockets around the city. So for all I know there are a dozen really good coffee shops comparable to FOONG. Or maybe there are none, and The Force drew me here. 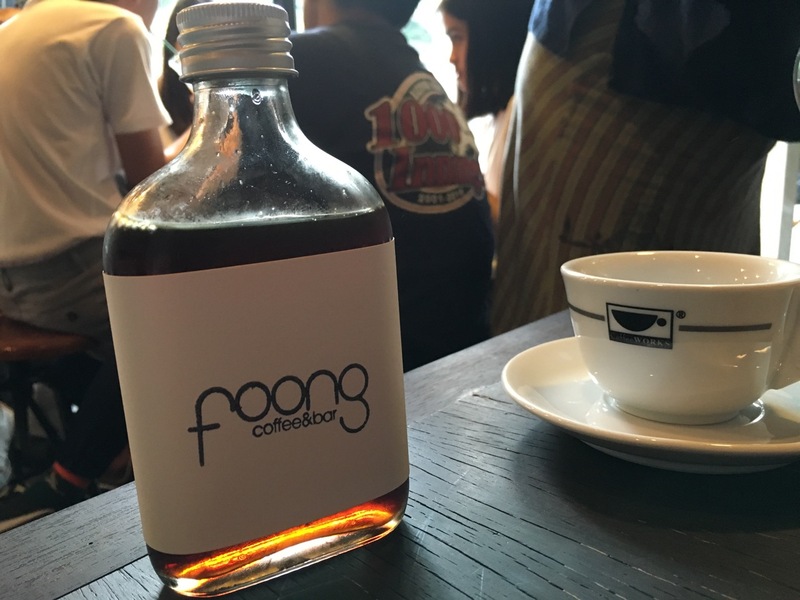 Either way, of the six or eight coffee shops I have visited so far in Bangkok, FOONG is the best, with great service, a nice ambiance, and really good coffee and food.